This was probably my favourite of all the samples. I'm on a huger cleanser-kick at the moment because I'm still so in love with my new Braun Face brush (see review here) and it's great trying out new products with it. The 'Hydrating Cleanser + Freshener' does exactly what it says on the tin. Cleansers can often be quite drying as they seem to delve deep into you skin and often take a lot of the moisture with them. However, this one left your skin feel really refreshed and without that tight-dehydrated feeling that I'm so accustomed too after washing my face. The 'fresh' nature would make it an ideal product to use at the start of the day to wake you up, but, equally, I love putting my head on the pillow at night with that 'clean' feeling. 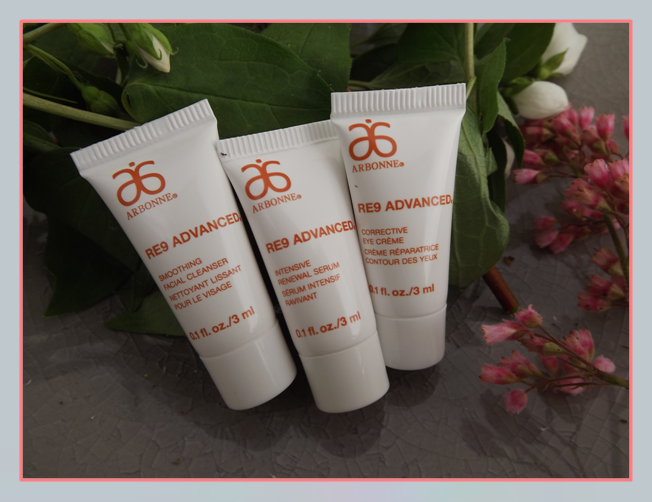 You can find this on the Arbonne website: here. I recently read that sun damage on your face makes you appear far older than wrinkles than do. As a result, I try to encorporate SPF into my daily skin routine to prevent damage from whatever I'm exposed to during the day. Sun screen can often be very oily, so it takes a really great skincare brand to encorporate it into their products without messing with the consistency of the original product. Luckily, Arbonne have achieved this with their 'Nurturing Day Lotion'. Although it smells slightly like sun screen, it applies like a typical day moisturiser and doesn't leave you feeling oily. I always make sure that I moisturise my face morning and night to keep my skin soft and supple. I know that some people are often cynical as to whether you'd need a separate 'day' and 'night' moisturiser - but I'm actually in favour of them. Of a morning, I like a light moisturiser that will sink in quickly allowing me to apply make-up on top easily. At night, I like a thicker, more hydrating moisturiser that'll act on my skin throughout the night and give it the TLC it needs. The only thing with night moisturisers is that they can be a little heavy or oily, but the Arbonne Night Creme has the balance just right. It's very hydrating, but is absorbed very quickly into your skin so you're not left with an oily residue. This is great as you're not going to end up with a pillow coated in moisturiser, but you're still going to have lovely, hydrated skin in the morning. I tend to go a little crazy with my eye make-up, so at night I love to gently dot eye creme all around my eyes to soothe and nourish the skin. The consistency of this eye creme is light enough to be very easy to apply, but also rich enough to give you that instant, hydrated feeling. If you're someone that works on a computer all day or just suffers from achey eyes or headaches, then you should definitely try applying a nice eye creme at night - it really helps to soothe this area and relax you. This is another cleanser that I really enjoyed using. This one has more of a very light, gel-consistency and actually gives a little bit of foam as you rub it it. It feels very gentle on the skin, but definitely does a good job. It also has a lovely, but subtle, fruity scent! I love the fact that it has a toner in combination with the cleanser as it helps to close up those pores after you've cleansed them. The idea of a lotion which will absorb by oil throughout the day is amazing, but I'm not quite sure how it would work. I worried that it might be drying or, alternatively, not really make much of a difference. I have to say, when applying it I didn't see an effect, but I think this is a product that might work better at absorbing oil that is being produced as opposed to that that already exists. It could be a good lotion to apply under make-up to prevent oil degrading your make-up during the day. This is the range most suited to those of us with aging skin. 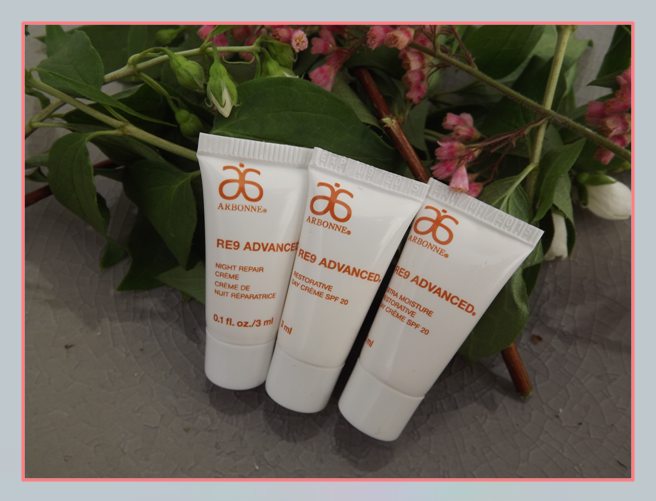 Arbonne have published some pretty impressive claims, which I'll type out for you below, and so I asked my mum to try the products out and to tell me what she thought. 100% reported improvement in skin moisturisation. Just like me, my mum loves a good cleanser. After using this for a few days she said that she definitely did see a reduction in black heads, but the cleanser was pretty drying. The cleanser is supposed to be 'smoothing' and so it would make sense for this to involve removal of dry and dead skin cells. Perhaps the dehydration nature is part of it and as long as you use a good moisturiser afterwards I'm sure you'd see some great results with a reduction in texture. My mum really enjoyed this serum - it's absorbed quickly, but leaves your skin feeling silky smooth. The consistency is very light and looks somewhat milky. I think this would be a good product to put on areas of your face where you've noticed more unevenness or texture. 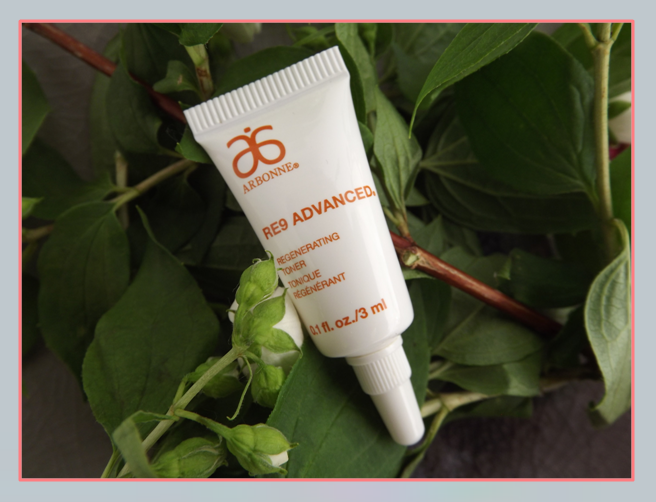 The eye creme from the RE9 Advanced range is thicker than that in the FC5 range. I suppose the theory behind this is that aging skin might need a more intense moisturiser. Mum has really enjoyed applying this, particularly at the outer corner of her eyes. It also has a nice cooling effect which is really soothing in your temple area. Compared to other toners my mum and I have tried, this one is a lot less drying and gives you an instant smooth effect. This is a great product to use over your nose and upper cheeks if you suffer from blackheads and enlarged pores. To me, this creme smells of apple and cinnamon! Delicious. Although it's a thicker creme it's very smooth and this makes it easy to rub in to your face. Surprisingly, it's absorbed very quickly and doesn't leave you with residue or shine. This was probably my mum's favourite out of the bunch! My mum described this creme as being a good day creme for someone with dry skin. It's slightly on the thick side and you have to make sure you rub it in completely to remove the 'whiteness' - probably coming from the SPF. It'll leave your skin with a very slight residue, but for someone with dry skin this is important as it'll ensure your moisture is topped up throughout the day. If you're someone that works outside, this would be a great protective day creme and this would also be a great moisturiser for someone who suffers with dry skin. If you have oily skin, I would suggest using one of Arbonne's lighter day cremes instead. Our opinions on this creme were pretty much the same as the less 'extreme' version, however this one leaves more of a residue. If you're in need of some intense moisturisation then this is the one for you. My mum suffers from incredibly sensitive skin, but none of the products in the RE9 range gave her a bad reaction. It's quite rare for anti-aging products to be suitable for sensitive skin because they're usually quite intense, but if you do suffer with sensitive skin then the RE9 range is a great option for you! 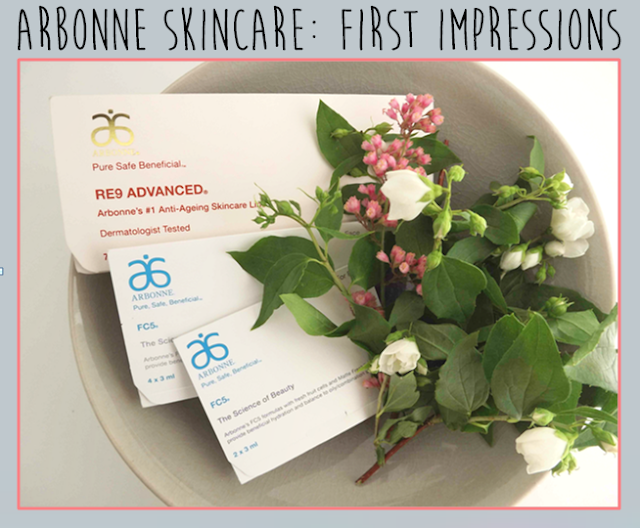 Overall, I was impressed with Arbonne skincare! My favourites, by far, were the cleansers and if you were going to try one, I'd recommend the hydrating cleanser and freshener. Again, if you want to have a look at the complete range of products then check out Danielle's Arbonne website: here.